While working at hospitals like, the National Heart Hospital, National Chest Hospital, and the National Hospital, Queen Square, London, she developed interest in cardiology. 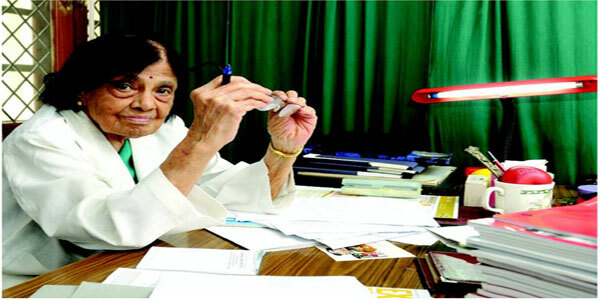 She began her career in India in 1953 as a lecturer at Lady Hardinge Medical College, Delhi. The founder president of the All India Heart Foundation, she understands that cardiology is a tough field for women to enter into, because there is no fixed routine or timings. But she is glad that women are coming forward and taking up this challenge well. A recipient of the Padma Bhushan and the Padma Vibhushan, and an Emeritus Professor of Medicine and Cardiology of the University of Delhi, she is now the Director of the National Heart Institute. At the age of 93, Dr. Padmavati is still a practising cardiologist. Her devotion and commitment are unparalleled. She is India’s first woman cardiologist. She achieved this superb feat because she never gave up on her dream of becoming a heart specialist – especially during a period of time when women doctors were heavily discriminated against as medicine was not seen as a ‘proper’ or ‘suitable’ profession for women. But, Dr. Padmavati, as she herself states, was quite lucky in being surrounded by supportive and encouraging male colleagues, who treated her with the utmost equality and respect. She is also of the opinion that it is in the West that female doctors were discriminated against more than in India. Her decision to return to India after having studied in the UK and worked in Sweden is commendable indeed. She refused to participate in the brain drain of intellectuals from her native land and decided to act as a responsible citizen of the country by giving back to it in the form of health services. Dr. Padmavati serves as an inspiration not only for the millions of aspiring female doctors but also those who are bogged down by the age factor. Age is merely a number and it all exists in the head – if one ‘feels’ old and incapable, then one cannot hope to achieve much or to make great strides in one’s field. But if one possesses the courage to overcome the limitations posed by the natural process of ageing, one can hope to achieve much, and also help others by setting a vivid and vibrant example. What the human mind conceives, it achieves!